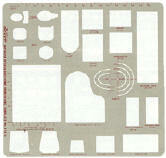 Contains cutouts useful for designing the interiors of homes. Scale:1/2"=1'-0". Size: 9-1/2" x 10" x.030"